Captain Rory Best is among those out of the Munster clash. ULSTER ARE FACING something of an injury crisis ahead of their New Year’s Day inter-pro against Munster with Les Kiss set to be without as many as 10 players for the Guinness Pro14 clash. In addition to those players sidelined through injury, Ireland internationals Iain Henderson and Jacob Stockdale will be unavailable as their workload is managed during the busy Christmas and New Year period. Captain Rory Best, Luke Marshall, Tommy Bowe, Sean Reidy and Chris Henry are among those already ruled out of Munster’s visit to Kingspan Stadium on Monday [KO 5.30pm], while Marcell Coetzee, Jared Payne, Matthew Dalton, John Andrew and Johnny Simpson are also out of action. Second row Kieran Treadwell was expected to be back available but injured his ankle during squad training this afternoon and has emerged as a major doubt. Kiss will, however, hand out-half Christian Lealiifano a recall after the Australian was rested for the northern province’s heavy defeat to Connacht before Christmas while Stuart McCloskey, Charles Piutau, Kyle McCall, Rob Herring and Rodney Ah You are all in the selection picture. 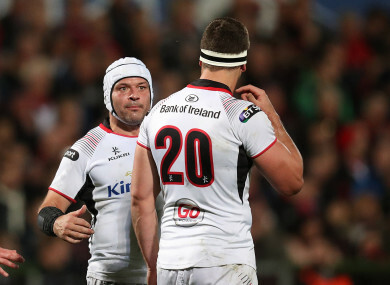 Ulster and Kiss are under pressure heading into the round 12 clash after a third Pro14 loss of the season saw them lose further ground on the top two in Conference B. The Ulster director of rugby admitted last Saturday’s hammering in Galway was the worst performance in his two-and-a-half years in charge and is in desperate need of a big response from his side in the second inter-pro of the festive schedule. Email “Ulster facing injury crisis ahead of New Year's Day inter-pro against Munster ”. Feedback on “Ulster facing injury crisis ahead of New Year's Day inter-pro against Munster ”.